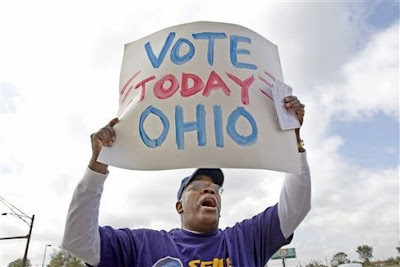 Group News Blog: Today is Election Day In Ohio; Early Voting-- Ready, Set, Go! Today is Election Day In Ohio; Early Voting-- Ready, Set, Go! In Ohio, today is Election Day. So is tomorrow. And so are the next 34 days. COLUMBUS, OHIO -- The campaign isn't over, but the voting is underway. Before watching the presidential debates and without waiting for the next round of TV ads, millions of voters who have made up their minds about John McCain and Barack Obama will cast ballots before election day, thanks to expansive new early-voting laws. Do you live in Ohio? Know anyone who does? Get the word out and Get your Vote on!